Now, Amherst leaders, mall tenants and neighbors of the region's oldest enclosed shopping center await more details about what Sinatra plans to do with the 64-acre property. "I'm excited it was somebody with local connections," Amherst Supervisor Brian J. Kulpa said in an interview. "I think it's safe to say we have a shared vision." Sinatra has said little about his bid. He first revealed his interest to The Buffalo News in February but he hasn't divulged his plans for the property or who his investors are in the project. "We are very pleased with the results and look forward to next steps," Sinatra said in a text message Wednesday afternoon. The winning bid of $24.05 million is four times the $6 million starting bid for the mall property, and it met the reserve price set by owner LNR Partners, according to the Ten-X Commercial site that hosted the auction. The reserve price – the minimum selling price set by the property owner prior to the auction – wasn't initially disclosed but Ten-X reported it was reached at $21.5 million. Ten-X also doesn't identify who was involved in the bidding. Bidding took place in increments that began at $1 million but shrank to $50,000 near the end. The online auction started at 11 a.m. Monday and was set to run through 1:12 p.m. Wednesday. But as bidding heated up near the end, Ten-X continued adding a few minutes at a time to the auction, which ended up running two hours past its initial closing time. Kulpa said he, employees in his office and workers in the town's Planning Department were glued to their computers watching the online auction progress. When bidding reached the reserve price, Kulpa said, "It was kind of like euphoria around here." Sinatra was the only developer who publicly expressed interest in the mall prior to the auction. 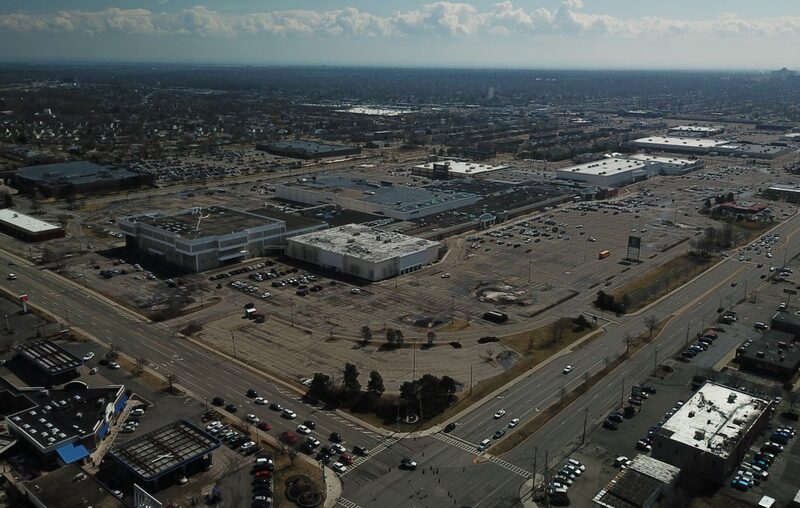 Benderson Development Co. was viewed as another likely bidder given its extensive holdings within the mall footprint and running north along Niagara Falls Boulevard. "We were interested, but our interest diminished when the pricing got as high as it did," said Eric L. Recoon, Benderson's vice president for development and leasing. Commercial real estate firm HFF marketed the site on behalf of LNR Partners, which is selling most of the land and buildings on the east side of Niagara Falls Boulevard between Maple Road and Almeda Avenue. It includes 557,000 square feet of rentable retail space that Ten-X states is 97 percent leased. The sale includes the buildings that house Buy Buy Baby, Michaels and Chili's. It does not include the J.C. Penney in the mall, owned by that corporation; the former Macy's men's store, owned by Benderson; and a former LA Fitness outlet, also owned by Benderson. "Whoever buys it is going to have to work with them," said A.J. Baynes, CEO of the Amherst Chamber of Commerce. Additionally, the Wegmans property just to the east of the mall proper, at 675 Alberta Drive, also held by LNR Partners, also went up for sale in an auction that closed just after 3 p.m. Wednesday. The final high bid for that parcel is $7.45 million, a figure that didn't meet its reserve price. Bidding for the Wegmans property started at $3 million. The identity of the high bidder is unknown but Sinatra said he did not bid on that parcel. "Our Alberta Drive store is one of our most successful. We are a tenant on this property, with a long-term lease," the company said in a statement after the auction concluded. "Regardless of what happens with the sale of the property, we will remain a tenant." HFF and LNR Partners have not commented on any aspect of the auction. The town and the Amherst Industrial Development Agency had worked for months to pitch the property to prospective investors and pledged to rezone the property to fit a mixed-use, high-density redevelopment of housing, retail and restaurants. They said the property is attractive because of its size, its location on heavily traveled Niagara Falls Boulevard and between the two University at Buffalo campuses, the commercial and residential density of the area that surrounds the mall and its inclusion along the projected path of an expanded Metro Rail. A key reason developers would bid on the property now is its inclusion in the federal opportunity zone program, which sets up targeted zones in high-poverty census tracts where investors and corporations can defer taxes they owe on capital gains. "It's a unique property. It's a unique parcel," Baynes said. "I anticipate the developer is going to redesign how that parcel looks, so there's going to be an inherent cost to that." For perspective on the high bid, in 2003, when the retail climate was vastly different, the McKinley Mall sold for $48.6 million. Uniland Development Co. one year ago paid $15.4 million to become co-owner of the Eastern Hills Mall. Amherst officials are optimistic the sale can close within the next 30 days. The developer faces a series of deadlines if he and his investors want to take full advantage of the opportunity zone tax credits. Kulpa said he plans to talk to Sinatra on Thursday but quoted a famous Winston Churchill speech to capture where things stand with the mall now that it's sold. "It's not the end. It's not even the beginning. Maybe it's the beginning of the end," he said. "We have so much work to do now." Sinatra, the founder of Sinatra & Co., has built a large portfolio of apartments and commercial space in this area, Chicago and Southern California. Most recently, Sinatra & Co. renovated the Market Arcade Building and partnered with William Paladino on a still-unfinished plan to convert the former Children's Hospital into Elmwood Crossing. And the state Erie Canal Harbor Development Corp. last year named Sinatra as the designated developer of two parcels at Canalside, where Sinatra plans to spend $21 million to construct two mixed-use buildings with apartments and restaurants.